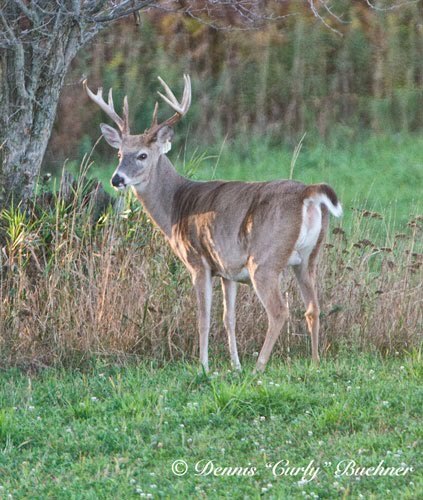 It was deer hunting season, and I was spending a long weekend at a friends house out in the country. 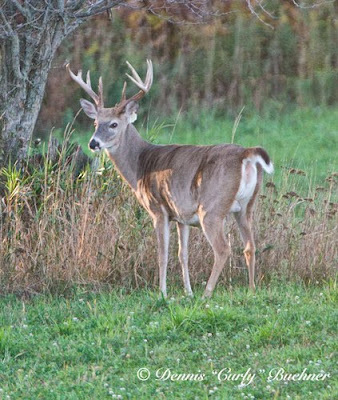 Her husband had several hunter friends, myself included, out hunting on the property late one afternoon. I had paired up with another hunter friend, Ronnie, to hunt off his stand and we were out in a gully on our way when we heard a thunderous noise. Before we even had a chance to think, a huge herd of cattle was stampeding towards us kicking up a wall of dust, dirt clods and debris; it looked like a storm. Ronnie tried to scare the cattle in a different direction but it didn't work and I dove under the roots/base of a large fallen tree at the head of the gully while he dove behind a large tree nearby. From where I was, it felt and sounded like an earthquake. I glanced up and could see the undersides of the cattle jumping over me...one wrong move and one of them could have landed right on me. I was terrified. Fortunately, we came out unscathed. Ronnie drove us back to our friends house and upon entering the kitchen, we were so shell shocked and weak in the knees, we both collasped on the kitchen floor in tears. It was the first time I ever saw this grown man cry. We sat there holding each other in total silence, teary and emotional until someone came home and jolted us back to reality. We were terrified realizing how close we came to being killed. Needless to say, that was the last time I went hunting!! Thanks Ronnie! My friends father had already planned to cook a nice brisket for everyone that night for dinner. He had already done the prep work and it had been marinating overnight. When he got in from the hunt, he took it out and fired up the grill and cooked the most succulent, fork tender brisket I had ever eaten. We planned to have a sit-down meal after the hunt but with the "excitement" of the day and that wonderful brisket, we were having cocktails and talking so much that we stood around eating the entire meal standing up, just picking at the food and eating the meat slice by slice before we realized everything was all gone! And it was wonderful that way too! Gotta be flexible! This can be done entirely in the oven, but it's better to follow the recipe. This marinade recipe can cook 2 large briskets, so mix it all then freeze half if you are only cooking one brisket. Mix all ingredients together except lemon pepper. Divide quantity and freeze half if not preparing 2 briskets. Marinate brisket in refrigerator for 24 hours. Remove brisket and place on broiling pan and season generously with lemon pepper and more garlic powder. Cover entire broiling pan & brisket with foil and seal well (I used a 9x13 pyrex casserole dish). Cook in oven at 250 degrees until 2/3 done, about 1 –1/2 hours. Take the remaining marinade the brisket was in and pour into a sauce pan and simmer on stove or on the pit while brisket cooks in the oven. 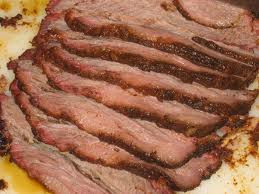 Take brisket out of foil (***SAVE JUICE) and place on BBQ pit over low burning coals. 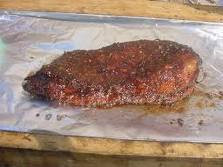 When brisket is browned well on both sides, wrap in foil again and cook on pit for another 30 min per pound. When done, slice brisket. Combine juice and pan drippings, pour over meat and serve. **** If you choose to cook the brisket entirely in the oven, just keep it covered and cook it at 250 degrees until done. It will take a few hours but is well worth it.